The Kaepa Touch cheerleading shoe is now available for purchase at Cheer and Pom and is already bumping its way to the top seller list. This shoe is designed for indoor/outdoor use and the sleek low profile design makes it appealing to cheerleaders at all levels. The stable platform of the Kaepa Touch is designed to provide superior support and an immediate sensory connection between base and flyer. This shoe has everything...a torsional outsole bridge, structural sidewall bands, and a reinforced textured toe for added durability. We have found that the Women's Kaepa Touch runs fairly true to size if you like a snug fit. Otherwise, we would recommend ordering 1/2 size larger than street shoe size. The kids sizes run a bit on the small side and only come in whole sizes so we would recommend ordering 1 full size larger than street shoe size to give adequate growing room. As always, these are just recommendations and not guaranteed fits. If you would like additional information, give us a call at 877-200-4944 or leave a comment below. Cheer and Pom offers competitive team pricing and Team Sales Specialists that will be happy to assist you with fitting yourself or your team for cheer shoes. I use a blue mat too... So that's a good question.... ? I´m the previous anonymous, and asking again, like does this shoe support your ankle enough? like kaepa sky does? The Kaepa Touch can be used on a blue mat or a spring floor. The cut around the ankle is a bit lower than the Kaepa Sky so it will feel different and provide different support. We have not had any negative feedback about the ankle support of this shoe. what really in use heel springpad do, when you tumble? The Springpad in the heel is designed to give you the effect of a spring floor while being worn on any surface. So tumbling would benefit the greateast from this feature. The Springpad provides shock absorption and overall comfort for the shoe. On the outside, on the bottom, does the heel spring pad thing feel like gel? Felt? Something else? Yes, it does feel like gel. Does this shoe provide arch support? And is it easy for bases to control while stunting? 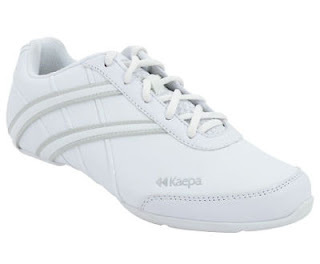 The Kaepa Touch has adequate arch support. This shoe is designed to provide a stable platform for tumbling and stunting. We have had very positive feedback on this shoe regarding basing and stunting. Hey! I have read your Blog this So Nice and Awesome service you have provided related to Cheerleading Shoes For Kids, I learn many new things from here about these shoes.